I am utterly devastated. I’m sure many who watched my current TV guilty pleasure last night, AMC’s The Walking Dead, are also grieving over Lori’s death in childbirth. I could say plenty of my sadness about the loss of a character I really liked, or the shattered innocence of her son Carl, or several other things about the writing of future episodes, but what I really want to talk about is my disappointment over how the writers portrayed the birth. 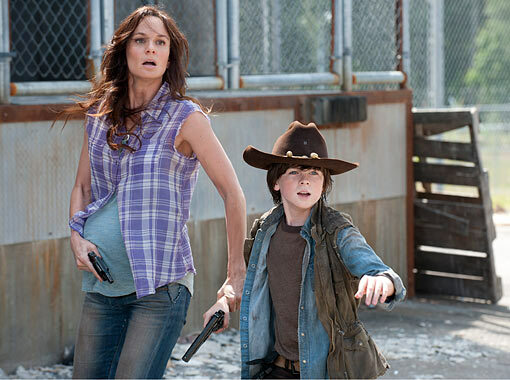 As soon as I learned in season 2 that Lori was pregnant, I was excited to see how the show would deal with the birth. Would it be realistic? Would the baby survive? Would she breastfeed, or would they stupidly look all over for formula in the midst of a zombie apocalypse? When the show revealed that Lori had had a previous cesarean section, I started to grow worried, especially when the characters indicated that they expected that she may need another one simply because of the first one . First off, there’s no reason to assume that a woman who has had a cesarean, by default, will need another one. Since they conveniently had a character who might be able to help her have the baby (even by cesarean if necessary), I held out hope that all would be well. Heck, maybe the writers would even have Lori rock a VBAC (vaginal birth after cesarean). That would be awesome! What transpired, was nothing short of just one more over-dramatized (or more like -traumatized) hollywood birth scene. I was hopeful initially that I might get to see that VBAC after all, when Maggie tells Lori that her body will know what to do. She even proceeds to labor upright and not on her back. Yes! But then after approximately two minutes of labor, Lori feels the urge to push, followed by a gush of blood and a panic in which Lori decides she will need that cesarean after all. But wait! There are Zombies outside the door and no trained people to do a cesarean and in one last mother’s sacrifice, Lori bleeds out gives her life to save her unborn child via an unanesthetized cesarean section in a boiler room. Besides the fact that as a mother, such a scene was horrific to watch, I felt gypped out seeing an empowering birth experience. Instead of a birth in which a woman trusts her body’s wisdom to give birth; once again, I saw birth portrayed as something scary, where a mother has no control, where nature is violent and only medical intervention (obviously unavailable in a post-zombie-apocalyptic world) can save her life. I know it is was written to be high drama (and is based on a comic series where she also dies eventually), but I could do with less drama and more real birth where a mother’s power and wisdom is valued. 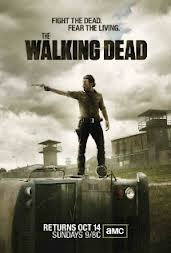 It kind of makes me want to leave The Walking Dead behind. I think I’ll go catch up on Call the Midwife.